Karen Christiansson passed away peacefully and unexpectedly in her sleep on the afternoon of June 3, 2015. She was deeply loved by her family and many friends and will be remembered for her big heart, kind spirit, generosity, creativity and love for life. Karen was born in Mellerup, Denmark on October 1, 1932, the only daughter and youngest child of Sigvard and Marie Christensen. Exhibiting a love of cooking, sewing and knitting, she attended a local Home Economics college where she continued to perfect her skills in these crafts. In 1954, she married Mogens Christiansson and moved to the United States in 1956 after the birth of their daughter, Jette, in 1955. After living in Newark, New Jersey for six months, she and her family moved west and eventually settled in Santa Barbara where they had two more daughters, Lise, born in 1957 and Hanne, born in 1958. Karen became involved in the local PTA and was a Girl Scout leader for her daughters throughout the years they attended grade school. Living far away from her family in Denmark, Karen joined the local Danish Sisterhood of America lodge to maintain and continue the Danish traditions she had been brought up with, and had recently been presented with her 50 year membership pin in the Danish Sisterhood. She took her first trip back to Denmark in 1963 and continued travelling back to “the old country” until her last trip back in 2014. Karen discovered a love of singing and joined the Santa Barbara Treble Clef Women’s Chorus in 1999 where she sang 2nd Soprano until her failing eyesight forced her to give up singing as she could no longer read the music. But this didn’t stop her from continuing to knit. During the last five years, she began knitting for various charities, including baby hats for Cottage Hospital, and hats and scarves for Stand Down for Veterans, participating in two local knitting groups. Karen was predeceased by her brother, Henning Yde and her grandson, Joshua Christiansson. 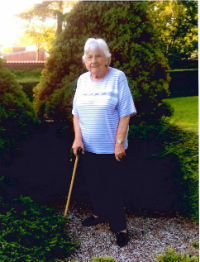 Besides her three daughters, she leaves behind two sons-in-law: Michael Luth (Hanne) and Dennis Trammell (Lise); three grandchildren (Morgan, Eric and Megan Luth); two great-grandchildren (Joslynne and Athena Christiansson); a brother (Leif Yde), as well as many cousins, nieces and nephews. She had the joy of seeing her daughter Jette become recently engaged to Tony Manuel. A celebration of her life and the life of her grandson Joshua will be held on Sunday, July 12, 2015, 1-4 pm at the house where she lived for over 49 years. If you would like to remember Karen, please do so with a donation to your favorite charity.